The HP 82240A (followed by the improved 82240B) is a little printer originally designed to print hard copies of calculations and graphs from HP calculators. It runs on either four AA batteries or an AC adapter and receives data via an infrared port. It prints on thermal receipt paper. Ever since the first Palm Pilots were unveiled, a few, perhaps several people, have hoped that someone would come through with a program allowing them to use their Palm Pilot with these printers. Redeye is this program. Redeye lets you print to HP 82240A and 82240B printers from a Palm OS handheld. Et la cerise sur le gâteau? Print international characters! Print tens of characters per second with efficient buffer utilization! Print for hours on end — 32K of text in one shot! Why is it called Redeye? 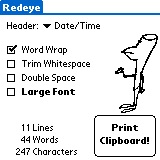 “Redeye” was HP's internal development name for the 82240A printer (and “Visine” was the name for the 82240B). Is this a big joke, like that bonsai kitten website?